Green Cap Mill was so called by the colour its cap had been painted. The above photo shows the mill after the 1898 fire with Press's High_Mill in the background. Green Cap Mill's tower stood at 92 ft. to the curb. The 9 storey mill had a Norfolk boat shaped cap, 4 double shuttered sails with 8 bays of shutters driving 4 pairs of French burr stones, 2 flour mills with jumpers attached, an 8 bladed fan and a chainpole. A stage was set around the 5th floor. A pigeon loft was incorporated into the tower. Tithe cause, Plaintiff Rector of South Town against defendants for an account of the Tithes of Mills in their occupation. Defendant WATERS - mill built within 50 years on the site of an old mill and is therefore an ancient mill - no support for this, therefore all recent mills. Defendants say they do not grind for hire in the usual way, but they are Corn and Grain merchants, that they buy the corn and grain, grind it and then sell the Flour in its manufactured state and they insist that for this operation no tithe is payable. Case dismissed as Defendants business regarded as a Trade on which no tithe was payable. Difficult to separate small amount of grist or Bag Work (for which tithe might be payable on the profits) from their main business as Corn Merchants. Counsel's opinion - Disagreed with judgment, might be a case for appeal, but costs would greatly exceed amount of tithe involved. The CAPITAL TOWER WINDMILL, DWELLING HOUSE and Requisite Outbuildings and about seven Acres of superior Meadow Land situate in Southtown, next Great Yarmouth and in the occupation of Mr. James Jenner. Further particulars will appear in future Papers and may in the meantime be had of Mr. Worship in Great Yarmouth, Solicitor. for the benefit of his Creditors. 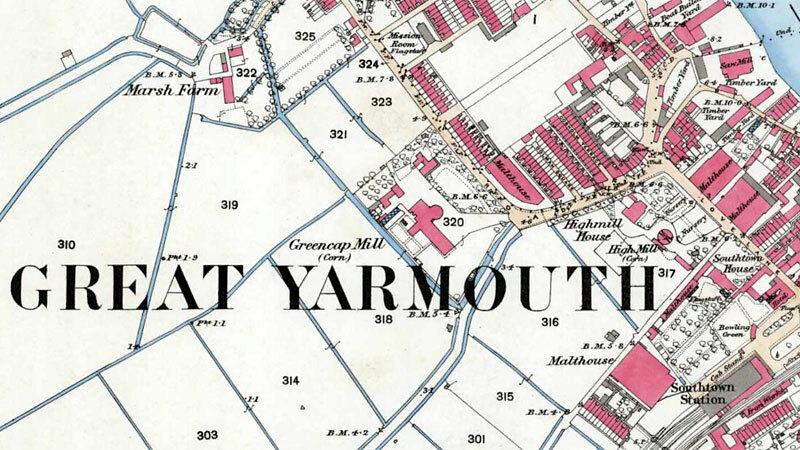 The following Valuable PROPERTY in the occupation of Mr. James Jenner, situate in Southtown next Great Yarmouth and at a short distance from the bridge there. The very superior Tower Windmill with patent sails, nine floors, four pair of the very best French stones, two flour mills and other requisite machinery of the first description. The Dwelling house near thereto consisting of . . .
A Cottage adjoining for a workman, three-stall stable, gig house, cart lodge etc. Attached to the Dwelling house is an excellent Garden . . . The above Property contains about 3 Acres of Land and is well fenced on all sides. The whole of the above is Freehold and subject to no outgoings beyond a nominal Land-tax. The Parochial Rates in Southtown are remarkably low. The MILL was built about 16 years since under the plans and superintendence of a celebrated Engineer. No cost was spared in the erection and it is in every respect deemed by competent judges to be the most COMPLETE IN ENGLAND. It is capable of manufacturing 120 Quarters of Wheat a week and its proximity to Yarmouth River affords great advantages in shipping to London and other markets. Early possession may be had. Particulars of Messrs. White & Borrett, No. 13 Great St. Helens, London and of Mr. Worship of Great Yarmouth, Solr. on the 1st September next. H. V. Worship, Solr. to Trustees. That very superior TOWER WINDMILL situate in the parish of SOUTHTOWN next GREAT YARMOUTH with Patent Sails, nine floors, four pair of the best French Stones, two Flour Mills with Jumpers attached and all other machinery of the first description. There is an excellent Dwelling House with Lawn and Shrubberies adjoining. The House consists of . . .
Adjoining the above is an excellent Cottage for a Workman and contiguous is an excellent three stalled Stable, Gig house, Cart lodge, Cow house, Piggeries etc. There is also a capital Garden and Orchard well planted with choice Fruit Trees. 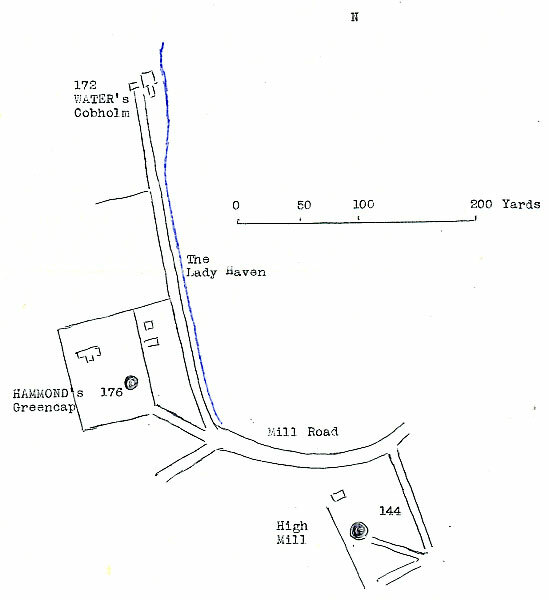 The Premises including the Mill, Dwelling House etc. contain altogether 5 acres of very superior Meadow and Arable Land. The whole of the above Property is Freehold and subject only to a nominal Land tax. The Parochial Rates are remarkably low. The Mill was built by a celebrated Engineer, no cost was spared in its erection and is in every respect allowed by competent judges to be the best engine of the kind in the kingdom; it is capable of manufacturing 100 quarters of wheat per week and it being within a few hundred yards of the Navigation affords every facility in shipping Flour to London and other Markets. Possession may be had at Christmas next. Apply to Mr. Thomas Hammond on the Premises who will show the Property. NB. A considerable portion of the Purchase Money may remain on Mortgage for a term of years id required at a modest rate of interest. Edward Press had previously run Swafield watermill in 1816. WANTED, a good STONEHAND as FOREMAN, one who has been accustomed to drive a Steam Engine preferred. Apply to Mr. E. Press, Southtown, Great Yarmouth. WANTED, a good Stoneman; one who has been used to driving a Steam Engine preferred. Apply to Mr. Press, Southtown, Great Yarmouth. In 1815/16 a windmill (later called the Green Cap Mill), a dwelling house and other buildings were erected. Richard Hammond conveyed mill etc. to Edward Press in 1855. Subsequent mortgages by and reconveyances to, the Press family. Insurance policy of 1862 describes machinery in mills. WANTED, a good Practical MILLER. Reference required. Apply to Mr. George Press, Green Cap Mill, Yarmouth, or at the Corn Exchange, Norwich. WANTED, a First Class STONEMAN. Apply to George Press at his Mill, Southtown, Yarmouth or on Saturday at his Stand in the Norwich Corn Market. A severe thunderstorm passed over this town on Wednesday (5th) afternoon and was accompanied with very heavy showers of hail and rain . . . During the tempest, a mill in Southtown belonging to Mr. Press was struck by lightning and one of its sails somewhat damaged. Wanted, Two experienced STONEMEN & One SPOUTS-MAN. Apply PRESS BROS. Stand, Norwich Corn Hall. WANTED, a First class STONEMAN & SPOUTSMAN. Apply to Press Bros., Great Yarmouth or at their Stand No. 22 Corn Exchange, Norwich. Apply to Press Bros. Southtown Mills, Great Yarmouth or at their Stand, No. 22, Corn Exchange, Norwich. Wanted, a First-class STONEMAN & GENERAL MILLER. Apply to Press Bros. Yarmouth or at their Stand, Corn Hall, Norwich. Prominent . . . was a lofty five-storeyed disused windmill without sails, utilised as the wheat cleaning department of the firm's business . . . This vertical structure, broad based and lofty with five storeys, of ponderously thick walls, at least three feet through, and a huge wooden cap at the summit with a balcony all round midway down, was filled with valuable machinery for dressing and cleaning dirty wheat. There were Boby cylinders to remove all impurities, such as cockle, barley etc., brushes to cleanse and scour the wheat berry from dirt, decorticators etc. This was one of the hot corners of the fire . . .
Not a solitary brick was shifted though the tower was open to the heavens and belched forth a constant stream of flame . . . The huge beams on the summit originally the stocks on which the long since heavy sails whirred... were of course soon involved . . .
. . . and the old mill burned until, everything within it was utterly consumed . . .
Few business premises were so well known in the town and neighbourhood as Press's Mills. They are speedily reached from Southtown road by a five minutes' walk down Mill lane and as pedestrian passes the Lady Haven public house the extensive building completely hide the western view across the marshes. Their erection began thirty years ago in a humble manner by the Brothers B. H. & E. Press. With the success of the firm additions were made from time to time until the structure became one of the largest of its kind in the town. The newest and best milling machinery was fixed up - until in one direction or another more than £20,000 had been spent upon the premises. Besides the main buildings a large tower-like mill had been fitted with expensive machinery. Thus both from an employer's and from a workman's point of view Press's Mill was the centre of a great trade and consequently yielded means for the employment of a large number of men. in respect of the situation of the mill, it may be added that in the west there is marshland, while on the south lie the station and Watling's maltings, to the east are the dwelling houses and W. Brown's maltings. In close proximity to the mill are warehouses stabling, outhouses and offices. Today, nothing remains of the great mills and the tower save the outer walls kept standing by the aid of a few blackened beams. On Saturday night, within the space of a couple of hours all were destroyed by a fire, the resistless fury of which is without parallel in local memory. At six o'clock the week's labour ended and with the closing of the mill's doors, no one had the least suspicion of danger. Within two hours afterwards messengers were running to the police station, horses were being galloped in hot haste and the town was startled by the sight of a great cloud of flame that hung over Cobholm Island. News of the outbreak was received at the station house at eight o'clock. Within ten or twelve minutes after, horses sent by Mr. Davis of St. Georges were harnessed to the fire engine, the fireman were in their places and reached the scene of the fire by about twenty four minutes past eight. The superintendent (Mr. Parker) at once saw that already the fire had taken so firm a hold upon the inflammable material that his efforts must be directed in saving adjoining property, while endeavouring to check the progress of the flames. Fortunately a large dyke in the rear of the burning building contained a capital supply of water. Then began a stubborn fight between the water and the fire. Victory rested with the brigade, whose really splendid work succeeded in keeping the fire within its original limits. For some time the keenest anxiety was felt for the safety of the cottages situated in front of the mills as well as other buildings. As a spectacle the scene was of the weirdest and grandest nature. The flames leaped from the buildings with such force and rapidity that, driven downwards by the strong wind they assumed the shape of waves of fire folding and unfolding themselves. At times, the line of the blaze would be blue, then it would change to amber and that again would give place to \dazzling white, according as different material were destroyed. The tower mill became a huge 100 ft. high fiery furnace, whence came booming sounds as the floors, heavy with machinery, fell, while from the windows the red and yellow flames wavered to and fro like huge banners. The illumination caused by this enormous pile of fire was such that in the rooms of the South Quay people could tell the time on their watches and see the patterns on the wall papers. The reflection was so vivid that away to Lowestoft to the south, the Fleggs and on to Whitlingham, people could see it and wondered what was happening at Yarmouth. In the town itself people ceased to buy and sell. The streets and the Market Place were deserted and then inhabitants streamed over Southtown bridge and deployed on the marsh to the west of the doomed mills. It was computed that 15,000 people stood until nearly ten o'clock watching the masterful way of the fire. One feature awoke a pathetic feeling and that was the death of the pigeons, which aroused from their nests, fluttered into the flames and perished by the score. Thanks to prompt assistance, ably directed by Mr. B. H. Press, his sons and others, the horses and pigs were all rescued. The total damage is set down at about £20,000 which is covered by insurance in the offices of the Essex & Suffolk & Commercial Union Fire Offices. FIRE. On Tuesday evening a disastrous fire occurred at the Mills of Messrs. PRSS BROS. LTD. at Cobholm. Just before 9 o'c flames were noticed issuing from the engine and boiler rooms . . . square building ablaze . . . The mills are situated on the west side of the river, not far from the haven bridge. . . . A year or so ago Messrs. PRESS's high mill* was destroyed in the same manner. . . . The gable to Steam Mill Lane is unsafe . . .
Tower mills . . . The Green Top mill of Mr. Press destroyed by fire 29 January 1898. GREAT YARMOUTH . . .
particularly well worth the attention of Builders, Speculators, Maltsters, & Investors. Great Yarmouth, Vendors' Solicitors, . . . or of the Auctioneers, 10 Regent Street, Yarmouth & Harleston, Stand No. 51 Corn Hall, Norwich. Hammond's mill occupied a position close to the Mill Road Co-operative Store . . . The mill had an adjoining granary plus a pigeon loft, and when it caught fire it is reported that bystanders saw the poor pigeons flying from the burning mill with their wings on fire. 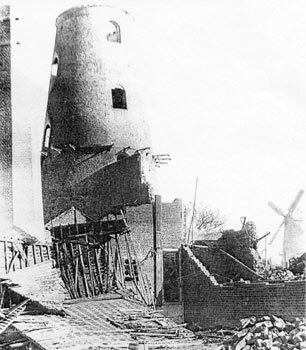 Rex Wailes reported that when the mill was demolished after the 1898 fire, the cap was removed in a complete state and installed on Pakefield towermill and later onto a towermill at Beccles.